Schalke beat Real Madrid on the night, however the reigning champions scraped through into the next round 5-4 on aggregate as the visitors offered a huge scare in breathtaking action at the Santiago Bernabeu. The visitors opened first half proceedings under inside a raucous Santiago Bernabeu; however Di Matteo's men faced a ginormous challenge climbing their way back into the tie as Ronaldo and Marcelo saw them off 2-0 in the first leg. Schalke made early inroads; scampering on the outskirts of Madrid's area. Hoger whipped a low cross in, however Casillas gathered at ease. First highlight of the game, and the visitors looked confident moving forward. 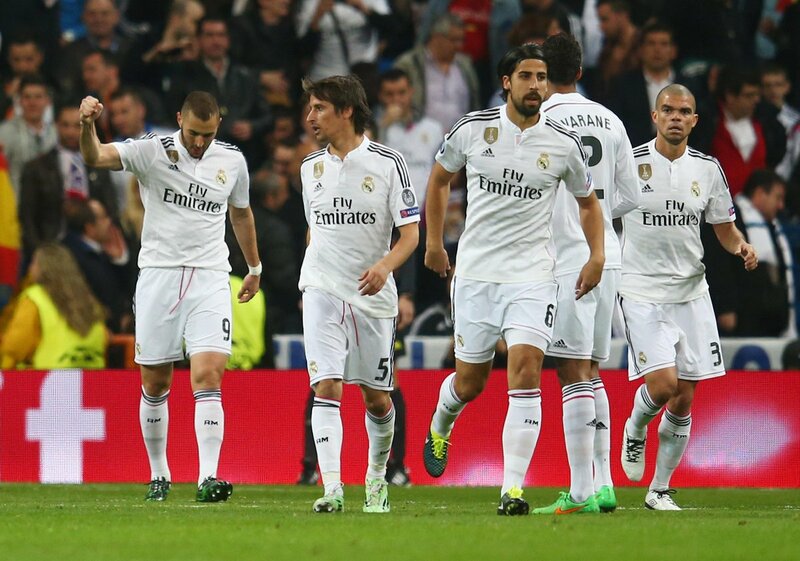 Hunting their opponent down, Madrid piled forward. Atrociously, centre back Howedes lashed a hideous headed clearance straight into the air which fell into Benzema's grasp. The Frenchman slid a pass through to Isco making a sharp run on the left, however his hesitation on whether to shoot or pass results in the Spaniard settling for a corner. It was a very open start to proceedings as both sides exchanged attacking play. Meyer blistered down the left and assisted Choupo-Moting in the centre. Positioned brilliantly, he ruined it by turning and lashing a right-footed strike at goal. Way too ambitious and perhaps stupid as his initial position was already dangerous for Madrid. This time it was Neustadter bursting down the wing. He whipped a ball into Choupo-Moting who then pulled it back to Meyer centrally. Poor defending from Madrid as the Schalke man battered a strike at Casillas; however a solid save denied Meyer of opening the scoring. However, the visitors' luck soon came. Meyer opened the sequence and stabbed a ball through to Barnetto who lashed a cross inside the area. Huntelaar let it slide under his legs where Fuchs picked up possession in space at close range where he curled a superb strike past a helpless Casillas, and a stunned Santiago Bernabeu. With confidence growing and growing for Schalke, they continued to pile forward down the right flank where Madrid's weakness seemed to lie. Meyer scampered up and down as Ancelotti's men failed to handle the raw pace of Schalke. Madrid earned a corner on the right side. With no expectations of an equalizer set to occur, up came Ronaldo. He superbly rose above Matip and guided a stunning header into the top left corner. Leroy Sane replaced Choupo-Moting after the Schalke attacker injured his foot. Very untimely like Huntelaar's in the first leg. Huntelaar would soon cancel out Ronaldo's equalizer, though. The Dutchman initially smacked the post with a terrific effort, however when the visitors recycled play he was the first to latch onto Meyler's parried effort; thus the striker prodded home. On the brink of half time, Madrid's hero struck once more. Coentrao whipped in a terrific delivery into the area where star man Ronaldo yet again rose above Schalke's defence to plant a superb header into goal. Where would Madrid be without him? The Portuguese man put his side back on level terms twice as referee Damir Skomina signaled the end to first half proceedings. Ronaldo's second equalizer didn't appear to dampen Schalke's spirit as they opened the second half how they played the first. Attacking, confident football. Benzema ensured Madrid would rack their aggregate lead up to three goals 10 minutes following the break. Coentrao, involved in yet another goal, prodded a sweet pass to the Frenchman as he dazzled around Schalke's area. Continuing to march forward in a one-sided direction and Wellenreuther already committing to a tackle, Benzema slotted a brilliant strike inside the bottom right hand corner; giving Madrid a 5-2 aggregate lead. However, this scintillating game took yet another twist as 19-year old Leroy Sane scored on his Champions League debut. The Schalke man dazzled outside Madrid's box until turning onto his right foot and battering an unstoppable strike past Casillas into the top left hand corner. Kroos retrieved possession from 25 yards out and smashed a ruthless strike at goal. Wellenreuther, on his tip toes, only just managed to parry over the crossbar and out. From the resulting corner; Bale planted a useless header well over. Schalke completely turned the game around courtesy of Huntelaar's superb effort. Sane blistered forward and assisted the Dutchman who found himself onside and in on Casillas' goal. He scampered forward and battered a shot; clattering onto the bar and in. Amazing action. Schalke only needed one more goal to put last year's champions out and bodies piled forward in attempts to do exactly that. Howedes found himself outside the area where he poked an effort at goal in which Casillas smothered. The referee concluded proceedings and what breathtaking action we saw at the Bernabeu. Hardly impressive from Madrid, partly due to Schalke's amazing spirit. How will Los Blancos react to this scare? Aston Villa: Belief back for Clarets? 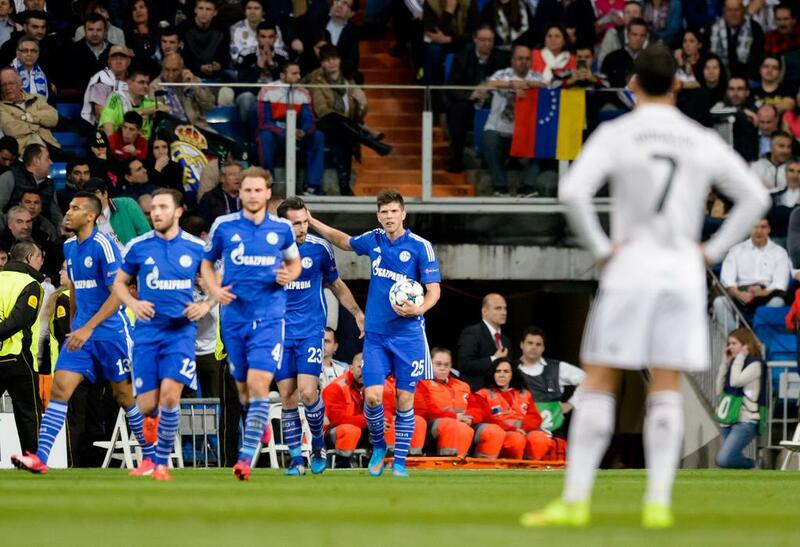 Match report: Champions League Round of 16 second leg, Real Madrid vs. Schalke.